MASSIVE VOODOO: Step by Step: After the SMC is before the SMC! Step by Step: After the SMC is before the SMC! time for another article up on Massive Voodoo via Massive Voodoo's year of the painter. 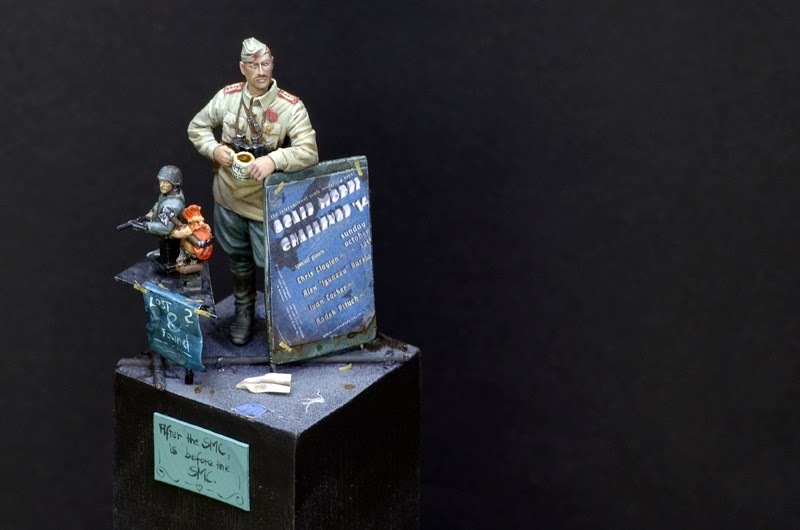 On one hand it is a traditional historical miniature in 1:35, but personalized with a funny background to become a gift to Robert Crombeecke, part of the strong force that is the organisation of the event in Veldhoven and a good friend of the MV Jungle. We hope you enjoy the article and find it inspirational! Taking a historical model and turning it into something special was the goal. Something special connected to the great impressions I had from my first year at the Scale Model Challenge in 2013. Time for the project was limited as the event approached with quick steps, but it was important for me to have it done in time. Robert is really a great guy and he is always pulling a lot of strings to help the crew of Massive Voodoo to be at the SMC and this time having a little surprise for him was just the right thing. I had this model in my figure-drawer since sometime and planned to do it ehm, traditional. Maybe in connection to a tank or a 1:35 vehicle. 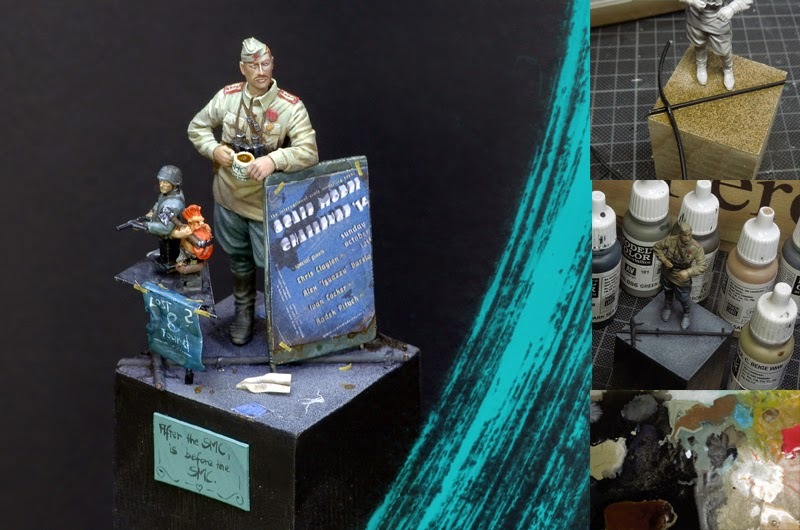 As soon as the idea arose to have it as a gift for Robert is threw those plans away and wanted to create a piece that shows the miniature madness going on at the SMC. I hope you enjoy the article and might find it interesting. A simple four-edged plinth was the start of it all. I thought back to the floor at the halls of the Scale Model Challenge and remembered a fine dark-grey carpet with a touch of purple in it. I was not sure if my mind played tricks on me, but off I started. 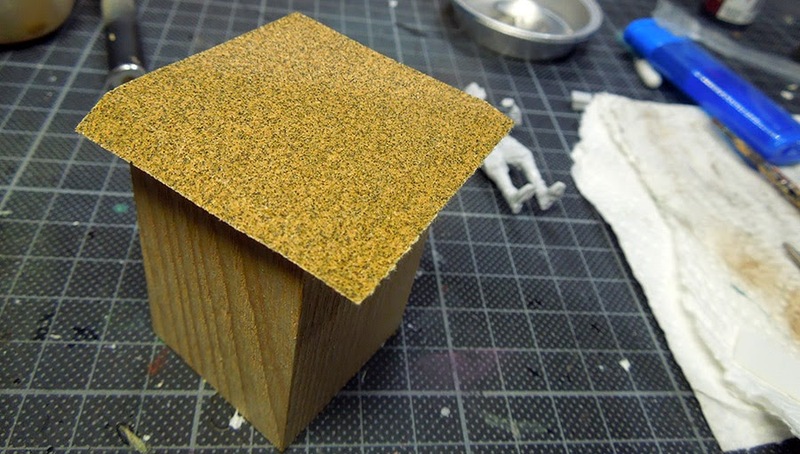 With a massive drop of superglue I glued 80' sandpaper to the plinth. My idea was to use this quick way for the carpet structure. 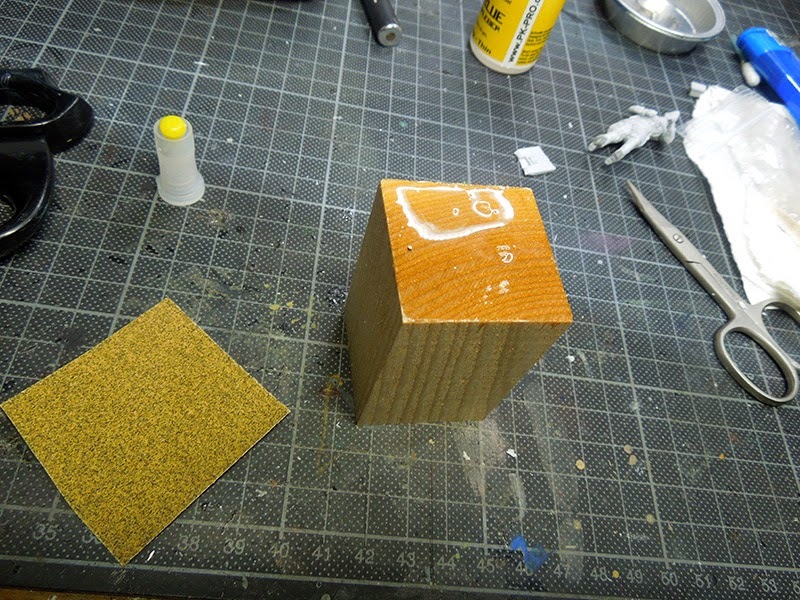 You can also use sandpaper to create asphalt or concrete for quick gaming bases. Raffa then mentioned that there were not many cables on the floor at the SMC as they have many plug sockets in the ground. Ahh shiat, well my memories are playing tricks on me. Nevermind. On my base there would be cables now. That's it for the base, not much more at the moment. 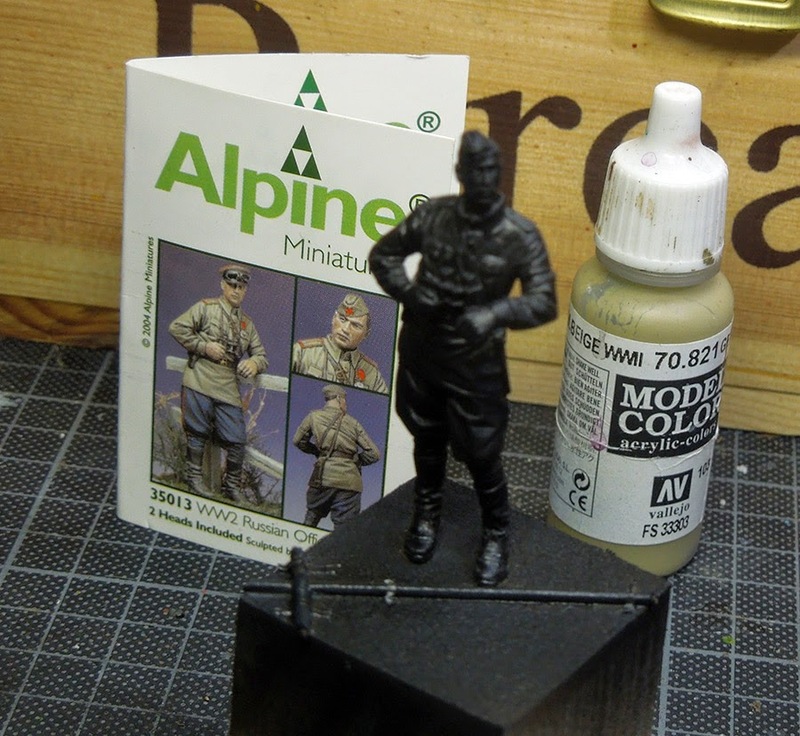 Decided to head over to the paintwork and create everything which I might need during the progress. Time was running short. 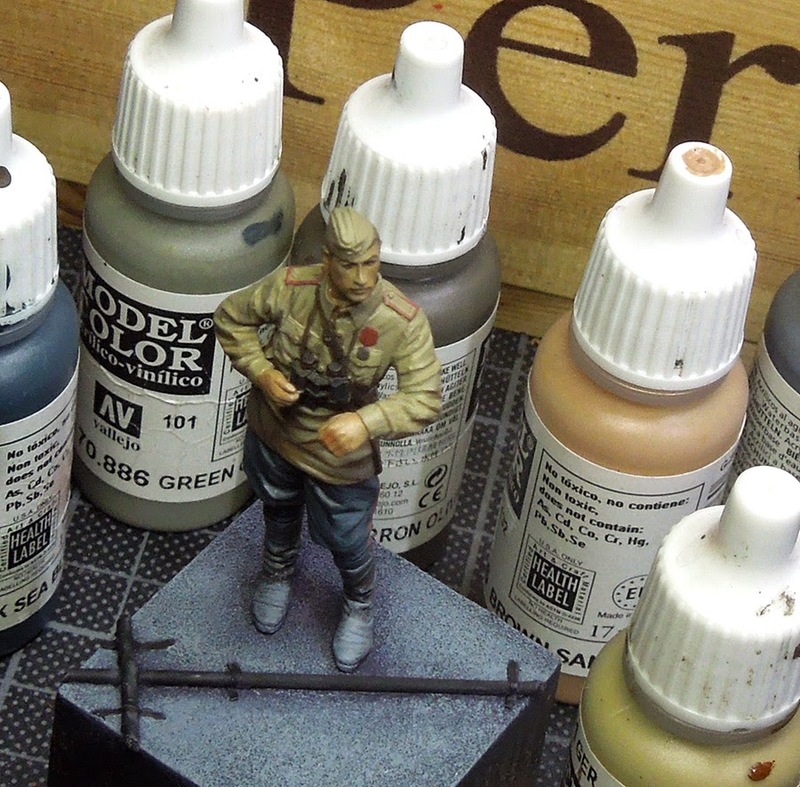 Now I took the Airbrush to spray the main colour onto the models uniform. I am not sure if I used the correct historical colour nuance, but having in mind where this model will lead to I did not care. 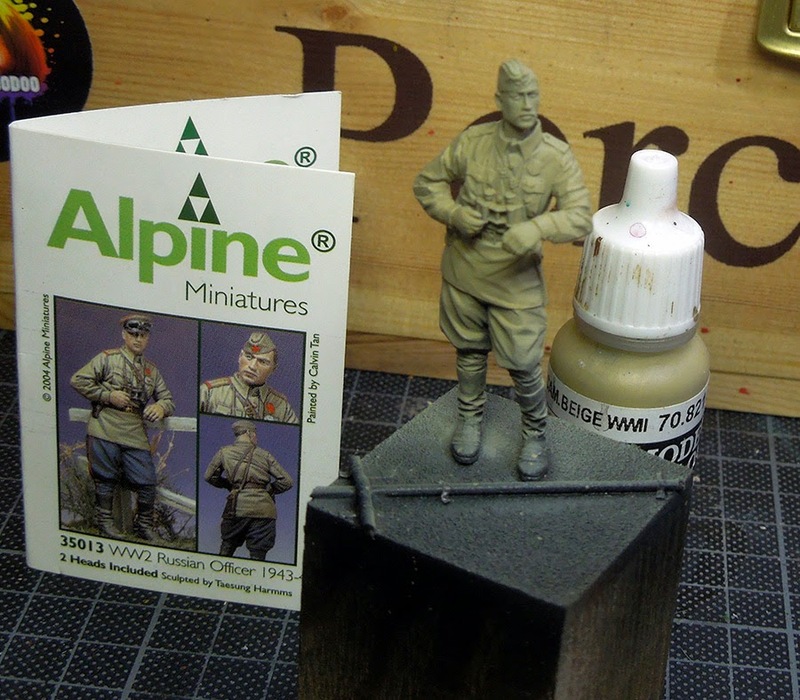 After the initial colour on the model I used Army Painter's strong tone via the airbrush and sprayed a soft shadow into the model. As this was meant to be a quick project I then headed over to the groundwork. Used some dark greyish purple there but had in mind to drybrush it later on with bright grey. Right now it looks strange. VMC Dark Sea blue plus a tiny drop of VMC Green Grey in it was used to bring on the basic colour of his trousers. 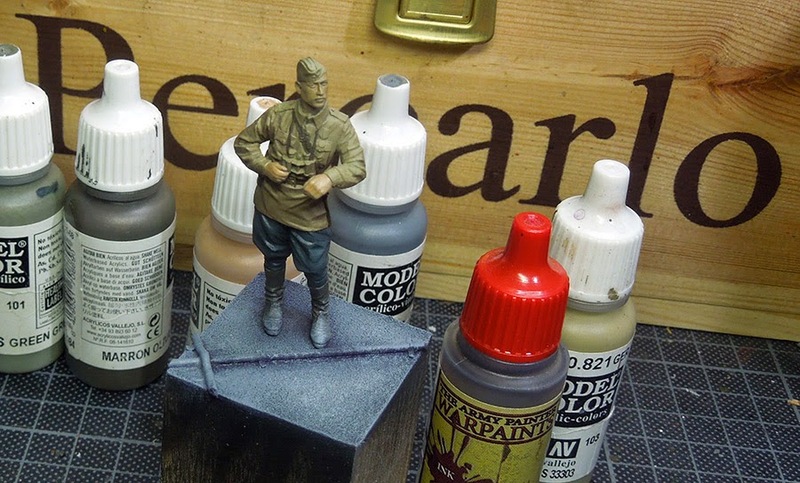 VMC US Olive Drab plus a drop of Green Grey was used to bring the basic tone to his boots. Next step was getting rid of that strange looking purple by drybrushing the ground with VMC neutral grey. Ahh I did hit his shoes too but I did not care. 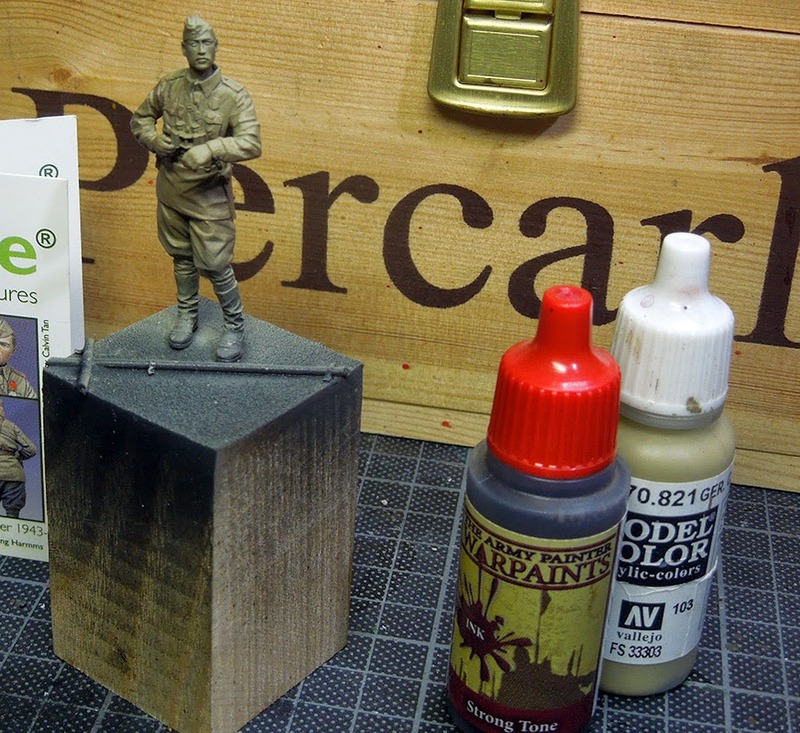 Using VMC Sand Brown as the basic tone of the skin. 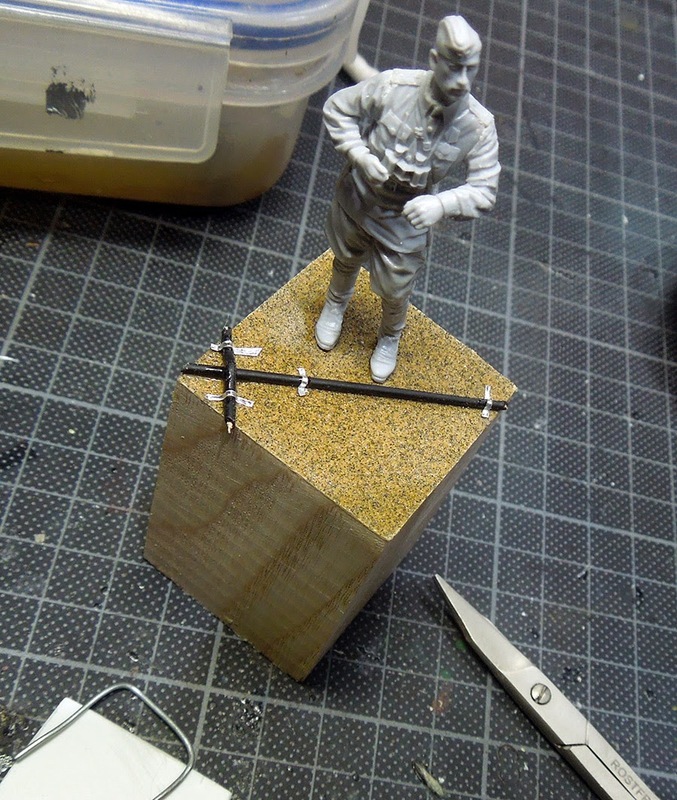 Cables on the ground, metal parts on the model and eyes were painted black. I was ready to dive deeper in the model. 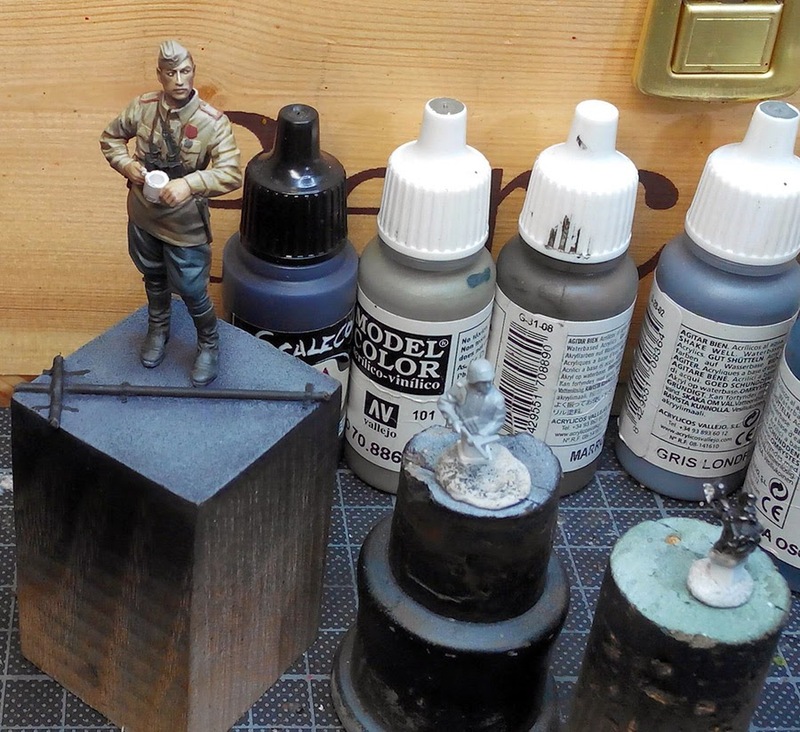 Using a dark brown for the leather belts, a red for the uniform parts to get a better feeling of the overall look. 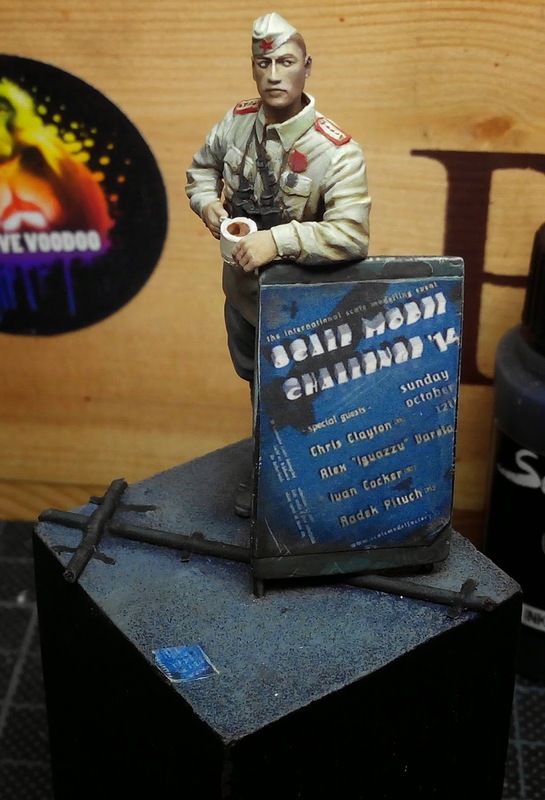 After this was done it was time to paint some highlights on his uniform, hat, shoes and trousers. 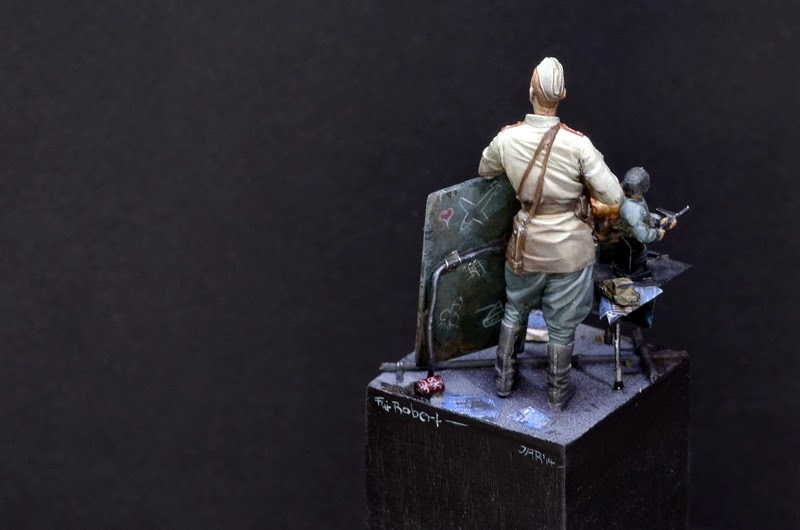 Some time was used to increase the contrast on the miniatures surfaces. Following I went in for some fun. 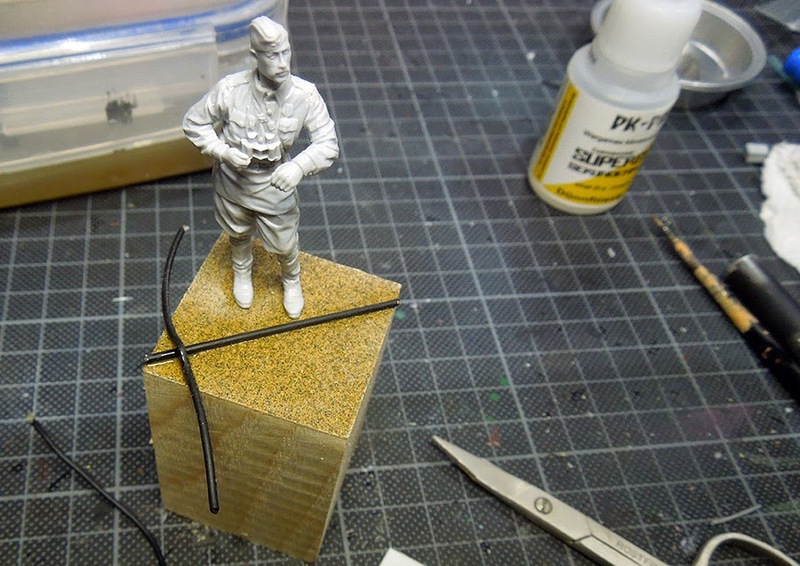 I scratchbuild a small cup for coffee or tea to his hand and prepared tiny models on miniature plasticcard plinths. One is a 1:72 model cut in half to be a bust and the other one is a small dwarfen slayer from a long forgotten Games Workshop game. Using a piece of plastic card as a poster wall and added a printed poster of the SMC to it. Also did place a smaller one as a flyer to the ground as I planned to show a moment in the middle or close to the end of the show. People are still having fun, some traders are already closing their booths, the contest is over, etc. 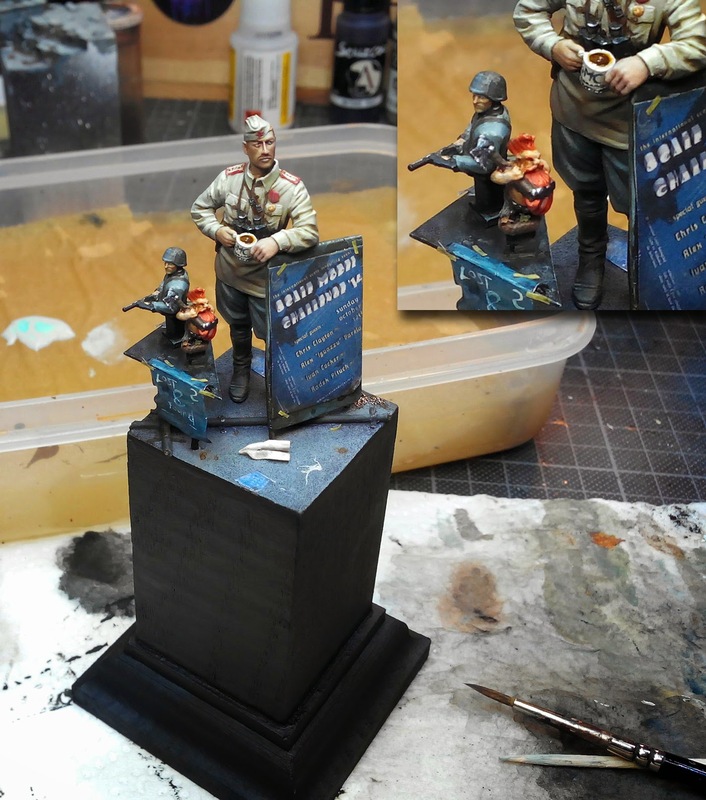 Well, some contest miniatures were also forgotten or lost and now the waiting soldier did not only recieve a unique Scale Model Challenge cup. He additional recieved a part of a small table were "Lost & Found" Miniatures are collected and waiting for their righteous owners. All Posters were placed realisticly with tape. As time was really running short now I just used Airbrush masking tape pieces for this. Some dirt was put to the ground: Spilled coffee, a chewing gum, a coke can and a paper plane, done traditionally, but smaller from paper. Some more flyers too. I also used this final stage of painting to clean up areas, to make them more smoother. A true fun project as a gift to a very kind person, Robert Crombeecke. I was really happy to give it to him as he was looking really surprised and happy even he was in the middle of the Scale Model action. 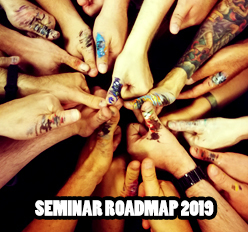 There are 3 Kommentare for Step by Step: After the SMC is before the SMC! I've noticed that you use VMC with your airbrush, which is the recipe to us this range with the airbrush? 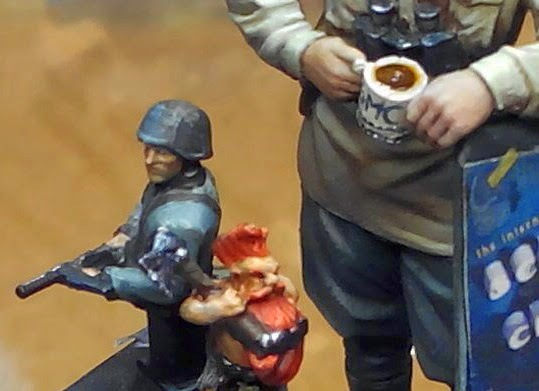 Thats a really cool, funny, quick paintjob. I like all those details you crammed into that little scene. 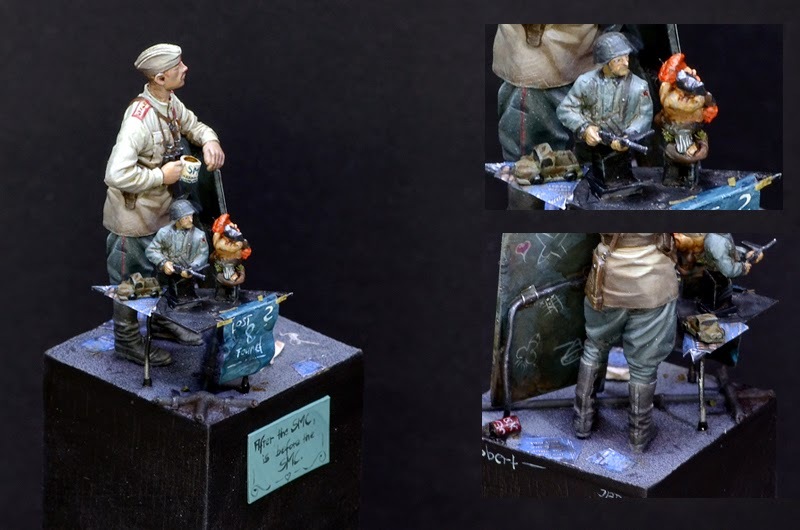 One of my favourites is the use of different scale miniatures in one project. 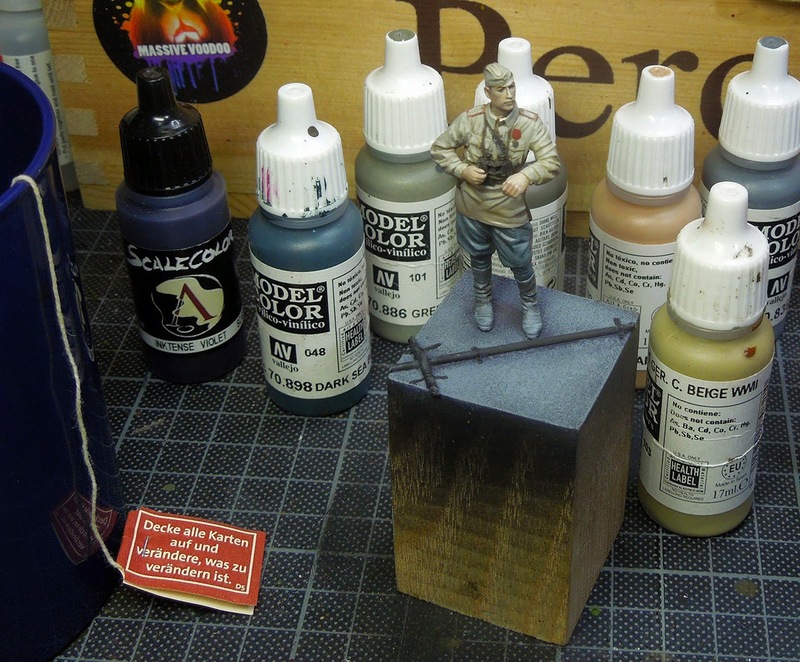 Using all my colour, including the VMC with Airbrush Thinner from Scale75. It depends if I want to spray opaque, then I use colour/thinner in 2/3 or if I want to spray as a glaze then I use the colour/thinner in 1/6 ... hope this helps. Thank you for your feedback. Yeah I like that too, doing different scales in one project is always a lot of fun. MV blog is on holiday! BANANALICIOUS - Random Prize Pool Update! Tutorial Voting: Magic Tilda Fails?